May you find great value in these Fools quotes and sayings. No one ever found wisdom without also being a fool. while the rest of the human race can cover its tracks. or perish together as fools. Anger dwells only in the bosom of fools. mostly knaves, and soldiers, mostly fools. Those who realize their folly are not true fools. Suffer fools gladly; they may be right. fools and the rest of us are in great danger of contagion. It is the false shame of fools to try to conceal wounds that have not healed. every man and wife gazing and smiling at them. Fools may our scorn, not envy, raise. For envy is a kind of praise. and people are such fools to begin with that it's compounding a felony. have discovered that they are fools. force cannot kill ideas? Nothing is easier. And once they are dead they are no more than corpses. the ingenuity of complete fools. Impossible is a word to be found only in the dictionary of fools. Is pride, the never-failing vice of fools. Fools admire, but men of sense approve. Those who claim to have had happy lives seem to be silly fools. Fools rush in where incumbents fear to tread. People have the power to redeem the work of fools. Black women as a group have never been fools. We couldn't afford to be. Prejudices are what fools use for reason. Despair is the conclusion of fools. Every man must wear out at least one pair of fools shoes. but in peace are only fit for fools. white is the color that it appears to be. It includes the gift of making any color appear white. and fools, who are the majority have always done just the opposite. but they are the money of fools. can practice thoughtlessness all the time are lairs and fools. only fools thumb their noses at such wisdom and learning. and those that think them wise, are greatest fools. Nations have come under the control of haters and fools. Politics will sooner or later make fools of everybody. provided this does not encourage them to take up more of my time. out of the hands of fools. but must also break his looking-glass. else the knaves would not have enough to live upon. Time makes fools of us all. Our only comfort is that greater shall come after us. Only fools and charlatans know everything and understand nothing. What is wealth? A dream of fools. Men who know themselves are no longer fools. They stand on the threshold of the door of Wisdom. I have great faith in fools; self-confidence my friends call it. Fools are more to be feared than the wicked. Bigotry murders religion to frighten fools with her ghost. Words are the money of fools. the enormous prosperity of Fools. and that limit you've reached. Change of weather is the discourse of fools. Baseball must be a great game to survive the fools who run it. how many fools does it require to make the public? Only fools live in the past or carry envy to the present. While fools shun one set of faults they run into the opposite one. 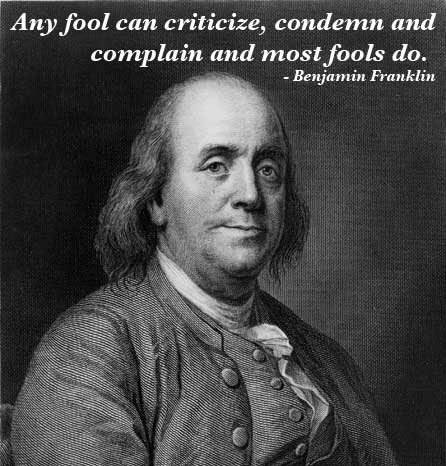 Thank you for visiting: Wise Quotes about Fools.